Are you looking to take your handicap to the next level this year? Are you struggling to get distance on your drives? Are you struggling to hit the fairway consistently? Well here at WhatAllTheProsUse, we have handpicked you the best cutting-edge drivers on the market this year which are guaranteed to help you stay on the fairway more often than not. We’ve spent countless hours swinging and studying different brands of drivers at different price ranges and we are now ready to geek out with you on some numbers and technology. To write this article, we tested over 41 drivers and what we have below may not be the most perfect review but if you are looking to find out whether you are making a good financial decision, then we hope this will help. Also check out our guide for Best Golf Irons which is a fascinating review of some of the top irons in the market right now. We also have an awesome guide on the top putters that actually improve your putting which you can check out by clicking here. So lets dive straight in. Here are our picks for the best drivers on the market in 2019! 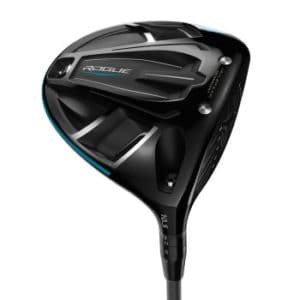 The Callaway Rouge driver head looks more stretched than the Epic at address and the teal colour is also a change. The new, stretched head design of the Callaway Rouge driver is what makes the club more forgiving and the creators state the driver has a 16% tighter shot dispersion. The design of the club head is to make the ball go further thanks to increased ball speed and energy returning to the golf ball following impact. The Epic had a sliding draw weight but Callaway said this was rarely used in the fade setting and that’s why the Callaway Rogue has just a standard and draw head. The Callaway Rogue has proved to be more forgiving than the Epic, especially around the toe but in terms of distance, there is not a great deal to separate the two clubs. For those who already own the Epic and are enjoying playing with the driver, the Rogue may not be of interest. However, those who have used the Epic or a similar driver but have struggled to control the ball, the Callaway Rogue is a great option. The club head speed is still present but the added forgiveness makes it easier to keep the ball on the fairway. The Rogue hybrid has already featured on our list and are known for their amazing consistency properties. Complete with a choice of four stock shafts, the Callaway Rogue driver lands at a premium price but the distance and forgiveness make it very tempting. Our Verdict: This is one of the most exciting golf clubs I have tested and I could not believe the feel you get on impact. Instantly feel like I was striking the ball better and hitting some powerful shots down the middle. If you are looking to change your driver, then the Rogue driver has to be considered (like this one on Amazon). Coming in at the lower end of the price scale for a new driver, the Cobra King F8 Driver has been designed with accuracy and forgiveness in mind. While accuracy and forgiveness should not come at the cost of other aspects of a driver, the aesthetics of the Cobra King F8 Driver are not what they could be. The busy looking crown will not be to everyone’s taste and some may even find it off putting. The Cobra King F8 Driver will not win any prizes for the way it looks on the shelf but that should not deter you from giving it a go on the range. If you are looking for a lower priced driver with great forgiveness then Cobra King F8 Driver could be the one for you. Off centre hits remain steady and the distance between longer and shorter hits are impressively small. The ball launches high off the driver which will suit mid to slow swing speeds but the lower loft range means the Cobra King F8 driver is also suitable to players with a faster swing. The Cobra King F8 Gray/Black Driver is a very good all-round performer and while it will not win any awards for the way it looks, it is a very good driver for the price. Our Verdict: This is a highly anticipated driver before it’s release and for sure it does not disappoint. We particularly love how consistently the club played off centre as we were still getting pretty good distance on them. If this is something you are interested in, check out the price here on Amazon. Much like the driver reviewed above, the TaylorMade M4 driver has been designed to be more forgiving than the model that preceded it on the market. The club includes a new Twist Face technology and while it is always exciting to have a technological enhancement, does it produce results? The answer is yes and the TaylorMade M4 driver has 41g of weight positioned in the back pad of the club face for maximum forgiveness. The face of the driver is very similar to the M3 and the curvature offers players more forgiveness by taking spin off the shots which miss the sweet spot. The TaylorMade M4 driver is great for players who are struggling for consistent accuracy as shots become tighter and longer. If you are a big Taylormade fan then you will probably will know that their M4 fairway wood is pretty awesome too. However, when striking the ball out of the middle of the driver, the feeling and result is fantastic. Once you have caught the sweet spot, you will be eager to pull out the TaylorMade M4 driver on every long hole, which is a brilliant feeling to have on the golf course. Our Verdict: Boasting a high launch and low spin, lovely design and feel in the hands, if you are looking to purchase a new driver, you will struggle to beat the TaylorMade M4 Driver for value. You can pick these up for a pretty good price (like here on Amazon). You can immediately see when looking at the PGX Offset that this driver offers something different. The name is also a giveaway and the PGX Offset helps you to square the ball on impact as this is vital for hitting straight drives. The PGX Offset does this by incorporating special offset technology that reduces the slice by always giving you a square face. 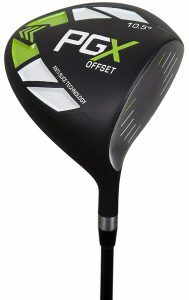 The sweet spot on the PGX Offset is huge and this adds to the overall forgiveness of the driver, which is very good. If you are having trouble slicing the ball off the tee and cannot seem to prevent it for happening, then you should perhaps give the PGX Offset a try. The club is not expensive and the matte back finish with green stripes certainly looks the part. The PGX Offset is lightweight which helps when generating clubhead speed through the ball and the weight distribution means the club feels balanced. You may notice you lose a little distance on shots compared to other drivers but if this means you are hitting the ball straight it is a compromise worth making. Always check to see what the rules are when entering a tournament as the large face of the PGX Offset may not always be legal. However, for playing with family and friends, it is perfect if you want to eradicate that annoying slice. Our Verdict: If like me you see your shots look very nice as they head towards the woods, then these might be worth looking into. The way the face is set up, they will help eliminate that slice and get the ball really high up in the air. Also, when you then take into account the price, this is an absolute bargain. 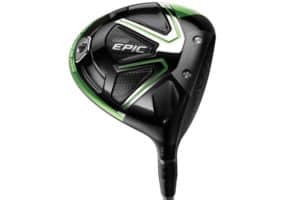 The Callaway GBB Epic Star Driver has been on the market for well over a year now and has performed well in terms of sales despite the premium price tag. What are the main reasons behind its success? The Callaway GBB Epic Star Driver was the lightest driver ever created by the brand at the time of writing and this perhaps goes some way to understanding why it has been so successful in Japan. The Callaway GBB Epic Star Driver looks very slick, with a black pear shaped head and gold detail. The design is very nice and appeals to many golfers but the best feature of this driver is the light weight and this makes it ideal for players with slower swing speeds. This driver boasts the Callaway Jailbreak Technology which comprises of two rods that extend from the crown to the sole in the club head. This increases the forgiveness of the driver and that is one area where the Callaway GBB Epic Star Driver excels. Another aspect which can be considered a strong point of the Callaway GBB Epic Star Driver is distance. Even players with a slow club head speed can hit the ball a long way with the Callaway GBB Epic Star Driver and it has led to golfers hitting the ball further than they ever have before. The only noticeable negative aspect of the Callaway GBB Epic Star Driver is its adaptability. If you are a player who likes to play technical shots using various draws and fades, this driver is not for you. However, if you are searching for a lightweight driver with plenty of forgiveness and distance, the Callaway GBB Epic Star Driver comes highly recommended. Our Verdict: Any big golf enthusiast will probably have heard of the GBB Epic range and it is no surprise that they are top of the list in many golfers opinions. The feel is absolutely amazing and just looks beautiful with its craftsmanship. I encourage you to go check them out as they are available for such a good price (like this one on Amazon). For many golfers the name Cleveland means a putter or wedge but the company have also designed some very nice drivers and the Cleveland Launcher HB driver falls into that category. This driver comes without any custom fitting and is ideal for those who want to purchase a driver off the shelf. The HB stands for HiBore and this has been redesigned in the Cleveland Launcher HB driver to position the weight of the club in the back of the head. The idea being this will give the driver more launch and forgiveness off the tee. With no room for adjustment, those who like to tinker with their set-up may stay away from the Cleveland Launcher HB driver but this allows the club to remove some weight and produce faster swing speeds. The carry distance of the Cleveland Launcher HB driver is not that of the more expensive models on the market but some golfers will come close to the driving distances of higher-end drivers. The ball launches high off the face, which is great for those players with a slower swing speed and forgiveness is good enough to keep things tight. Coming in at the lower end of the price scale, the Cleveland Launcher HB does not offer the distance and speed of more expensive clubs but is very good for the price. Our Verdict: What a great driver! You get loads of control and they are not joking around when they say that you’ll be launching these balls. You can pick these up for a pretty good price (like here on Amazon). The first thing which is noticeable about the PING G400 Max Driver is the size of the head. It has been increased from the original G400 to 460cc and this means shots which find the centre of the face should fly straighter and further. The PING G400 Max Driver certainly provides more forgiveness than its predecessor so in terms of an upgrade, it certainly hits the mark in that department. If you are a player who drives the ball with a slow or average swing speed, the PING G400 Max Driver is a good addition to your bag. The size of the head may be a little off-putting to some players at address but this is something you can get used to over time. The design of the club is pleasant on the eye, with a black forged face and ribbed head. Perhaps the only drawback to using the PING G400 Max Driver is the hollow, tinny sound it can produce on some shots. However, the PING G400 Max Driver feels solid and overall is a pleasure to use on the golf course and driving range. Our Verdict: Brilliant! Brilliant! Brilliant! When testing these out, we could’t help but see major improvements to our accuracy and length. You can pick these up for a pretty good price (like here on Amazon). 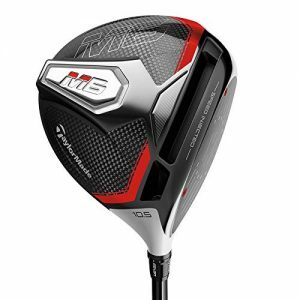 The TaylorMade M6 looks very stylish and the black and red colour patterns on the design give the club a very premium look. Indeed, this driver does not come cheap but you are getting something special for your money. During the manufacturing process, the head of the TaylorMade M6 is actually bigger than the legal limit but the company have found a way to get around it. The face of the TaylorMade M6 has been dialled back by injecting resin into two tuning slots, which you can see when looking at the face of the club. This places the driver right on the edge of the legal limit and the coefficient of restitution (COR) has been spread across the entire face. What this means is the TaylorMade M6 will transfer energy from the club to the ball efficiently, regardless of where on the club face contact is made. In other words, the forgiveness of the driver is very good and even off centre hits will deliver straighter shots, with less spin than other drivers on the market. The shaping of the TaylorMade M6 head has been designed to make the club more aerodynamic and this increases clubhead speed and distance. The carbon fibre sole allows for more of the weight to be used elsewhere in the clubhead and coupled with the inertia generator this adds to the overall forgiveness of the TaylorMade M6. If you are looking to find that extra bit of distance off the tee with a driver that’s easy to hit, the TaylorMade M6 is a great choice. Our Verdict: Not exactly cheap and one that requires the higher end of the budget, however, you can feel the difference. Absolutely fantastic feel and adds a good 20 yards to my usual shots. You can pick these up for a pretty good price (like here on Amazon). The first thing you will notice when picking up the Wilson Staff C300 Driver is the colour. The driver comes in a deep red colour and while that may appeal to some, it will not be suitable for every player. Wilson have adopted the technology used in their series of irons and incorporate Power Holes in the sole and the crown of the head of this driver. This has helped the Wilson Staff C300 Driver to produce an expanded sweet spot and works in conjunction with the Reactive Face Technology for a more consistent performance. Not only do the Power Holes assist the sweet spot of the Wilson Staff C300 Driver, they also help with alignment. Between them sits an alignment mark and this combines with the two Power Holes either side to make set-up a joy. Complete with adjustable sole weights and loft, you will need to see which combination works best for you when investing in this driver. You can tailor the Wilson Staff C300 Driver to work with any natural swing tendency and this will produce a high loft and low spin for maximum distance. Dispersion could perhaps be improved but overall, with a customer fitting, the Wilson Staff C300 Driver is one which should operate well in the hands of most golfers. Our Verdict: Probably not the first company when you think of big market players for drivers. However, I love the new technology with these and the colors will definitely set you apart from the others. You can pick these up for a pretty good price (like here on Amazon). Very similar technology to the D2 but different head shape. With the new technology we have got Surefit CG which is the weight system that goes in the back and is angled in a position where if you put a draw weight in there or a fade weight or there is a neutral weight, it will help customized the ball flight of your strike. Moveable weights are of course nothing new, but the challenge is always how to add in this feature without the necessary infrastructure taking up too much weight that could be put to better use elsewhere. The active recoil channel is slightly deeper and thicker in comparison to the D2 which is now being called the Recoil 2.0. This technology balances the flex acting on the club once it strikes the ball, evening it out across the face and entire body of the driver. It also contributes to making the driver more forgiving while reducing the rate of spinning. Having taken a few hits with the club, you notice that having the weight in the toe reduces the spin rate further because the center of gravity moves further forward towards the face. 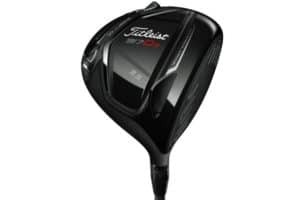 With Titleist, they only tend to bring out drivers every two years and therefore when they bring out some technology it is quite a bit different. With this driver, you get the feeling that they have done that, potentially something that has not been done before especially with the way the weight system has been integrated with this driver. Our Verdict: A very satisfying driver that performs consistently and gives you amazing control off the face. You can pick these up for a pretty good price (like here on Amazon).